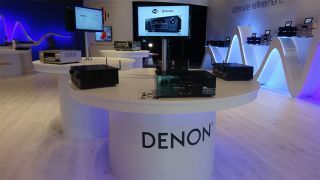 Denon announces five new AV receivers for 2015 | What Hi-Fi? Denon has unveiled its 2015 AV receiver line up, all of which offer support for both Dolby Atmos and DTS:X. The 5.1-channel AVR-X1200W is the entry-level model of the range. Official information is a little low, but we do know it offers six HDMI ins and one out, built-in wi-fi, Bluetooth streaming and 4K 60Hz pass through. Pricing is TBC, but we’d guess it to be around the £399 mark like its predecessor, the AVR-1100W. Next up is the AVR-2200W, which comes in at the AVR price sweet spot of £499. A 7.2-channel amp, expect 95W per channel (8ohm, 2ch driven), and all of the features above, plus DSD streaming support. As for connectivity, there are eight HDMI inputs (one front facing) and two outs, with two optical inputs, one USB port and two subwoofer preouts. Legacy connections are covered by four analogue inputs and two each of composite and component video inputs. The AVR-3200W takes a step-up in power at 105W per channel (8ohm, 2ch driven) and offers more by way of connections, adding two coaxial inputs and upping the legacy options to five analogue, three composite and two component inputs. There’s also the option of 7.2-channel pre-outs. It boasts higher quality video upscaling, up to 4K 60Hz, and offers the option for a second zone. It’ll cost £749. Also announced was the AVR-4200W, a 7.2-channel amp with 125W of power per channel (8ohm, 2ch driven) and a new 32-bit/192kHz DAC. You’ll get three HDMI outs here and once again legacy connections get a bump too, with six analogue ins, four composite ins with two out and two component ins with one out. There’s also a phono stage. Finally, last year’s flagship model, the 9.2-channel AVR-X7200W, returns this year, but with an added ‘A’. The only change here is that the AVR-X7200WA now supports HDCP 2.2 for 4K 60Hz pass through, but everything else remains. That means 150W of power per channel and Atmos support up to 7.1.2 (the others only support 5.1.2). Owners of the previous models can upgrade for £180, but new buyers should expect to pay £2499 for the new unit. It’s available now. The rest of the models will be available in August. We'll bring you our thoughts on them as soon as get them in our testing rooms.